Please welcome our fabulous massage therapists: Brian Garcia, Walt Philip, Jenny Robinson, Debbie Gail Trout and Suzy Knudsvig. I am still looking for one more CMT. They are all excited about supporting Team Left Hand by donating their time and helping you be ready to ride on Day 2. Click on the ‘donate to me’ button at the top of the screen or the ‘donate’ button below my picture and fill in a donation of $20.00 (rate of $1.00/minute) and your name in the donor recognition box. In the Personal Note box let me know which route you plan to ride: Short Route (45 miles to lunch), Express Route (65 miles), Classic Route (73 miles) or Century Route. This helps me manage the number of open appointments for the afternoon. You must use a credit card to make the donation. If you do not want to pay with a credit card, contact me at stvrainss@gmail.com and I will make other payment arrangements with you. You should sign up for a specific appointment time in the team tent after you cross the finish line at CSU. 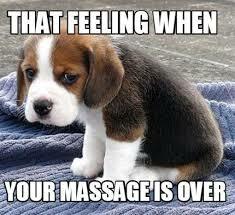 Just select an available time close to your arrival with any one of our fabulous massage therapists. It is recommended that you sign up soon after arriving since they fill up fast. And remember your appointment time! After your relaxing and refreshing massage, pay your complements with a generous tip. Usual tipping rate is 20%, but since they are donating their time you might consider at least $10 as a minimum. I missed donating for a massage before the Ride! What if I decide to get a massage after I arrive at CSU? Due to team size, I cannot guarantee there will be appointments available, especially mid to late afternoon. If a time is available, you can still sign up, but you must pay the $20.00 to MS plus a tip to your massage therapist that afternoon. Can I have a second massage? Yes, but only if appointment times are available, the waiting list is empty, and everyone who has prepaid has had the opportunity to sign up for one. You will need to pay $1.00/minute plus tip. Feel free to contact me with any questions. My email is stvrainss@gmail.com.